In an age of technology and intense competition, entrepreneurs and businessmen should be able to tap into a wider market, just like the world wide web. This challenge is also true with real estate brokers and realtors. Gone are the days of relying solely on traditional media to promote the properties. Tech-savvy professionals are getting ahead of the game, especially since Pinoys more or less go to their trusted search engine to locate available properties for sale or rent. However, some brokers and real estate entrepreneurs remain hesitant or are afraid to invest on websites or any online platform for their biz. Others just say they are too old for it, or they are not as tech-savvy as others, et cetera. 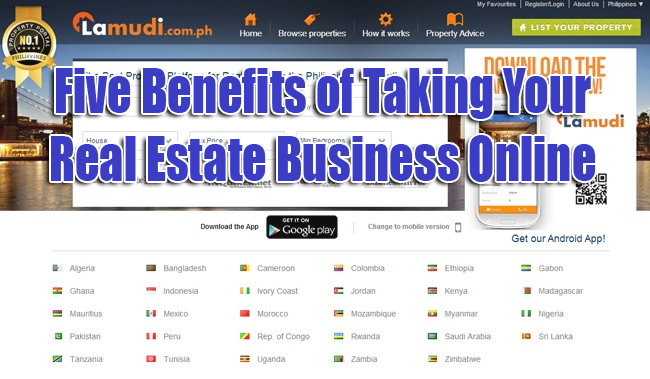 Because of this, Lamudi Philippines, the fastest growing real estate website in the Philippines, have put together a list of reasons why one should not hesitate to put their real estate business online.